Happy Feet is the base for one of the most popular sock yarns available from Plymouth Yarns. Now you can awaken your creative talents and add your own custom dyed colorway to this high quality, un-dyed sock yarn. 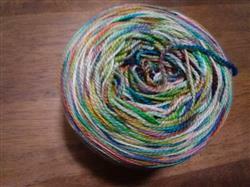 Lots of yardage ensures that your custom dyed skein will provide enough for a pair of socks or even a shawl! 480 yards per 125 gram skein. I bought this yarn to play with dyeing with Easter dye tablet's and they turned​ out great! Going to make baby socks with them for the fun and hope to give some little one some Happy Feet! Thanks so much for such a fun fiber to work with, and hope one day my spinning will turn out as good!!! Very surprised at how soft the Rose fiber is. Looking forward to try natural dye with the yarn.